Members of the Woman’s Club and Boy Scout Pack 36. 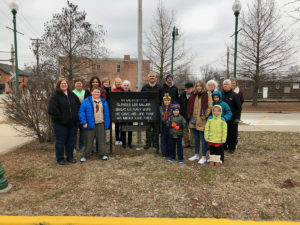 O’FALLON – The O’Fallon Woman’s Club and members of Boy Scout Pack 36 celebrated the life and World War II service of Glendle Miller, Boatswain’s mate 2nd Class, US Navy, at the club’s monthly flag ceremony on March 2. Miller was born near Harrisburg, Illinois, on May 30, 1921. He attended O’Fallon public schools and worked as a service station attendant before enlisting in the Navy on January 1, 1939. He received his training at the Great Lakes Naval Training Station after which he was assigned to a ship. Miller was one of the survivors of the Japanese attack at Pearl Harbor and later was assigned to the Cruiser New Orleans where he saw considerable action in the South Pacific. It was while he was stationed on the New Orleans that he was killed in action on November 30, 1942. His parents, John and Ada Miller, were notified by telegram on December 23. Miller was considered the third O’Fallon man to sacrifice his life for his country during World War II. Miller’s remains were not returned to the United States until 1948, after being temporally buried at the Navy cemetery at Tulagi Harbor, Solomon Islands. He arrived at Union Staton on March 4, 1948, and was escorted to O’Fallon by a delegation of the American Legion and VFW. He was the second serviceman killed in World War II to be returned home to O’Fallon. Miller’s funeral was held on March 6, 1948 at Wolfersberger-Meyer Funeral Home and was bored with full military honors at Valhalla Cemetery in Belleville. The vocalist for the ceremony was Mary Vincent, who sang the National Anthem. The next flag ceremony will be held on April 6 at 9 a.m. in downtown O’Fallon to honor Seaman Second Class Milton Sollis, US Navy World War II.